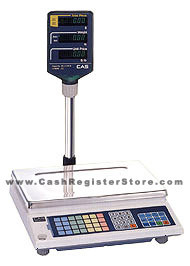 CAS AP-1 Electronic Weight Scales at Cash Register Store.com. The CAS model AP-1 price computing scale comes with a full load of features. Some features included are a stainless steel platter, and a flat spill resistant keyboard. The customer and operator display are located atop a pole for easy viewing by customer and operator. Front and rear bright LCD easy to read displays feature the unit price, weight and total price. The AP-1 has an optional large platter that can be added for multiple or large items that normally would not fit on smaller platters.